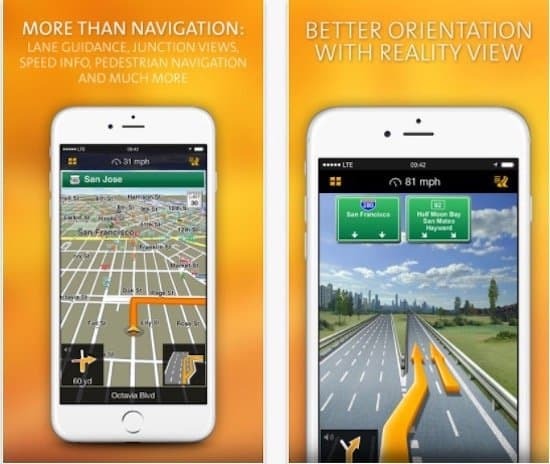 GPS apps for navigation are obviously very popular among iPhone users, effective use while mapping, turn-by-turn navigation and searching ability. Normally iPhone GPS apps are divided into two different categories maps-on-the-fly and on-board maps. Few iPhone GPS apps not just help you when you travel at an unknown place for the first time, but also tell you about the condition of the road and even provide information from the local community. 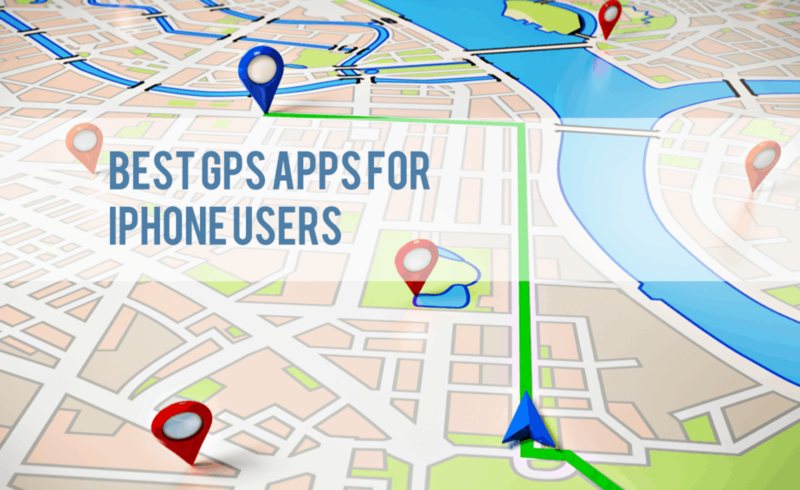 These GPS apps for iPhone are highly useful as they can save your precious time and money by providing accurate instructions about any place or location through easy to understand maps and other useful options. 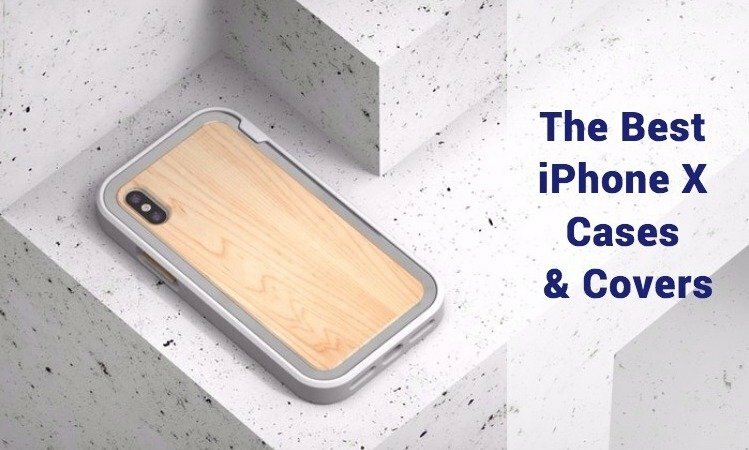 Here we are going to give you information about those best navigation apps for iPhone that take less memory, provide more accuracy and are easy to update. Google Maps is one of the best free iPhone GPS apps which is far better than Apple’s Maps app. It is user-friendly and provide more options to navigate such as voiced directions for bus, train and walking. It also provides traffic as well as turn-by-turn directions. Google maps offer High-resolution imagery view of streets with better accuracy level and touch-controlled panoramas of locations, thanks to Google Earth. Waze is a free extensive community based iPhone navigation app which includes tons of user relevant information. 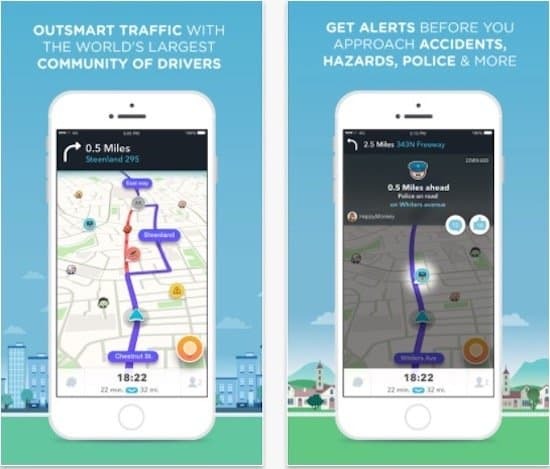 You can connect with the local community of drivers to share and get real-time traffic jam related information and come to know about speed trap, alerts about the road conditions etc. which ultimately saves your time and fuel. It features automatic routing when road condition gets changed and you can also add images to show how it is to help others. You can add more friends and share information on Twitter and Facebook. Get where you have to go with the MapQuest turn-by-turn GPS Navigation app. Voice navigation is available for driving or walking instructions or exploring points of interests on the map, MapQuest has the tools you need to navigate the United States and Canada. Includes many usefull features like real-time traffic updates, optimized routing that saves you time, route options to avoid highways or toll roads, multipoint routes, route choices and planning. Overall very solid choice for your gps needs. The highly useful and trustworthy AT&T Navigator comes for free for iPhone users, but requires a monthly subscription to use the service. Though, the developer has also given the options of yearly subscription, which is quite economical. The new version brags upgraded turn-by-turn design for navigation and includes 3D touch support. 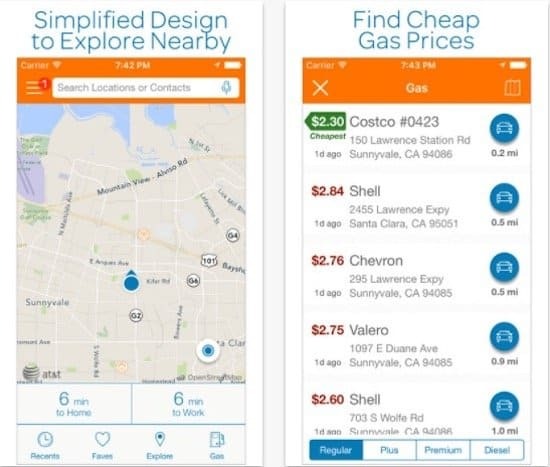 This app lets you real-time updates about the traffic through many useful features such as voice guided directions, free updates for map, spoken commands, the search facility for gas price, offline maps, integrated controls for iPod and many more. 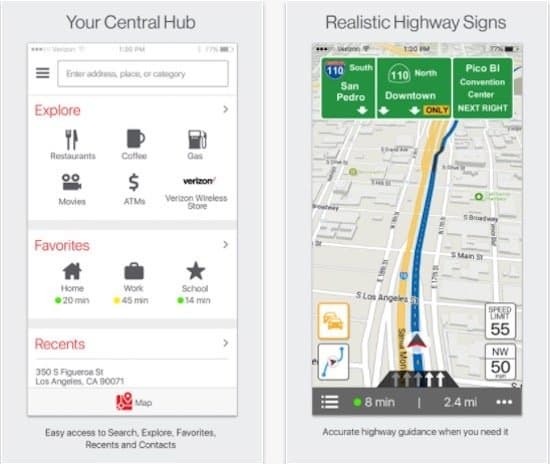 VZ Navigator is a premium iPhone GPS app which is free. The app is very popular due to its accuracy and easy to use interface. The application packs many useful features and provides fast and sharp functionality. You can personalize the local search and they have improved the gas search facility as well. Users get roadside assistance based on GPS location and even share the information on Facebook. The app provides support for Spanish Language and completely suitable for multi-tasking. 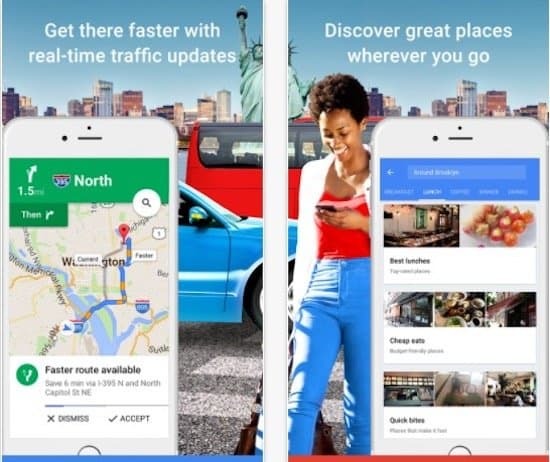 Navigation USA is one of the best iPhone GPS apps which is highly recommended for those who usually travel to unknown places as this provides on-board maps which help you to navigate the way easily. You save your memory space by using this app because it carries a roadmap on the phone only which can be used offline so even if you into a remote area where signals are weak, this app will help you to find your way. Navigation USA provides voice command, Traffic reports to avoid traffic jams, features like mobile speed traps give you information about dangerous spots and speed assistance helps you go over the speed limit. The app would cost you $49.99 (USA) and is compatible with both iPhone and iPad. Some of these best iPhone GPS apps are free and some are chargeable but provide excellent assistance which makes your ride safe and help you to reach the destination quickly. GPS navigation system is very important for frequent travelers, tourists, professional, students and even those who barely go somewhere because as they do not travel a lot, they tend to forget places and locations. These best GPS apps for iPhone include many useful features and provide you with real-time information about traffic and road conditions that saves your fuel as well as money. Hi, iPhone users can now make use of MapFactor GPS Navigation (Mapfactor Navigator), which is now available also for iOS devices. Navigator is a completely free GPS navigation app with free offline maps from OpenStreetMaps project. It offers intuitive voice turn-by-turn navigation and many useful features.